Last week, Mary asked me if I wanted to go to Evanston with her the following Thursday (today) to help her get leg band information on the male and female nesting on the library. Of course I said yes! This morning, when I got to the museum, I went directly to her office, ready to go. Mary met me at her closed office door. “Change of plans!” she said, opening the door and sliding in. A very tall box, perhaps 4 feet tall and 2 feet wide, sat in the middle of her office. She opened the top and we peered inside. A peregrine chick glared up at us from the bottom. “It’s one of the Wacker males. Mr. E/23,” she said. Mary told me that a very large group of people in Chicago volunteer to walk around the bottoms of skyscrapers every dawn during fall and spring migration. They rescue any live bird that has collided with buildings and bring any dead birds to the museum for study. 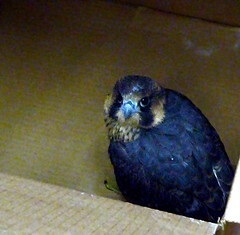 They often are the first people to find downed peregrine chicks. Sounded exciting to me. I’d never seen the zoo clinic. Bonus! We put E/23 into a more suitable, less vertical, box and headed up to Lincoln Park Zoo. Vet techs John and Katrina met us at the door and shuffled us into the big examination room where we met one of the staff veterinarians. They took E/23 from his box and did a thorough examination as he squawked nonstop and bit everything within reach. Finally, the vet gave him a stamp of approval and sent us on our way. Mary and I took him back downtown to the Wacker building. As we entered the room off the ledge, we could hear angry screeching outside. I looked out the trap door window and came face to face with an angry peregrine father. How the heck did he know we were coming? Mary and I finally made it to Evanston at 11:00am after an already exciting morning. We parked behind the downtown library and unpacked our gear. Rounding the corner to the front of the building, Mary pointed up. 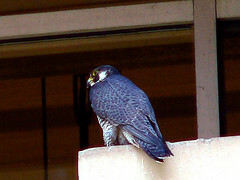 There, on top of one of the library’s columns, perched a large female falcon. We searched the sky and surrounding buildings and spotted the male on a skyscraper to the south, right up near the top. While she sat outside on a bench making calls, I lugged my stuff into the library and climbed the stairs to the third floor, hoping the windows behind the column weren’t higher than that. They were not. There she was, staring in through the window at the multitude of people quietly reading on the third floor. I managed to make only a few large bangs as I unloaded my many packs, set up my tripod, attached my scope, fired up my camera and opened my field journal. I felt very conspicuous until I looked through the eyepiece of my scope and read the top number. Then, the hunt for leg band numbers consumed me. The windows of the library were polarized making it very difficult to get a bright view of the tiny numbers, but after awhile, I managed: Black “64” over green “D” (b/g, 64/D). Mary joined me and confirmed. Mission accomplished. Obviously, we’d attracted attention by this time as people don’t generally set up that amount of equipment to read or use spotting scopes on tripods to find books in a library. 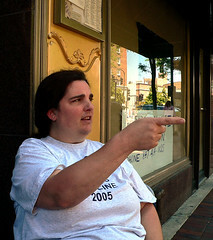 A smiling and tanned blond woman approached and introduced herself to me as Dale. Mary knew Dale, who had watched these peregrines for years. Dale is a talented artist who specializes in wildlife. She had a few drawings of peregrines with her which were impressive to say the least. Finally, we said goodbye to Dale and packed our things, hoping that the male would be closer to the ground when we got outside. Alas, he was not. This forced us to sit down at the pub across the street and order drinks and lunch in order to wait him out. Torture. He never did come down from his skyscraper perch, but Mary and I had a great time anyway. She’ll probably get the band numbers when the male attacks her as she’s trying to band the babies in a few weeks. ~ by Steph on June 8, 2006.